Company Name: KOYOH Co., LTD.
KOYOH Co., LTD. was established as a concrete block manufacturer in 1960. As a result of many years of research we have successfully infused a fermented soybean (Natto) bacillus into cement paste for utilization in effective water purification in 2000. This has resulted in a revolutionary concrete based purification system we named Eco-Bio Block. Our company is now propagating this EcoBio-Block all over the world. We are going to develop our technology to produce more environmentally-friendly products to make this world a better and healthier place. We are also selling a range of products related to water and the environment. We hope our products will be used by more and more people to improve the water conditions on a global scale. Decomposition of organic matter and removal of odor from rivers, Lakes, Marsh, Water channels, Ponds and etc. Removal of odor and removal of colon bacillius from animal cages and barns. Odor removal and sanitary control at household waste collection sites. Odor removal and sanitary control at runoff drains near houses. Effective bacteria (bacillius subtilis natto) repeats propagation every 30 minutes. Cleansing method that makes maximum use of “fermentation” mechanism based on aerobic bacteria and porous stones. 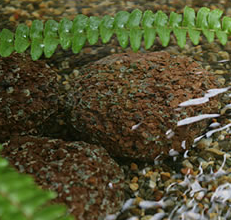 When effective bacteria come in contact with water, they start propagation in the porous stones and disperse outside of the block. 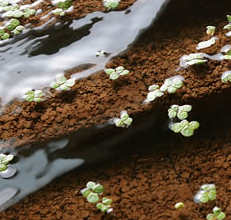 Organic matter is sucked in by the “Eco-Bio Block” Bacteria, settles, and decomposes,clarifying the water. 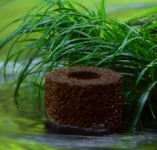 Because necessary nutrients are encased in the block, EcoBio-Block remains effective for a long period of time. Large scale Eco-Bio Block test of 3.2 km long water channel, by Indian government following proven results. The fact that electricity was not required was reported as an additional advantage. Ishibashiya Co., Ltd. – Konjac noodles are easy to eat and healthy!